Safety is of primary importance when burning fuels. That is why it's so critical to have a proper liner when burning wood or timber. Without a suitable escape route for the gases expelled from these fuels, your home could be overrun with carbon monoxide. This 150mm (6") solid fuel liner uses 316-grade stainless steel for both the inner and outer skins. This choice of material makes it one of the safest choices for flue liner in the fireplace industry. It is resistant to corrosion so you can be assured of your home's safety for many years to come. 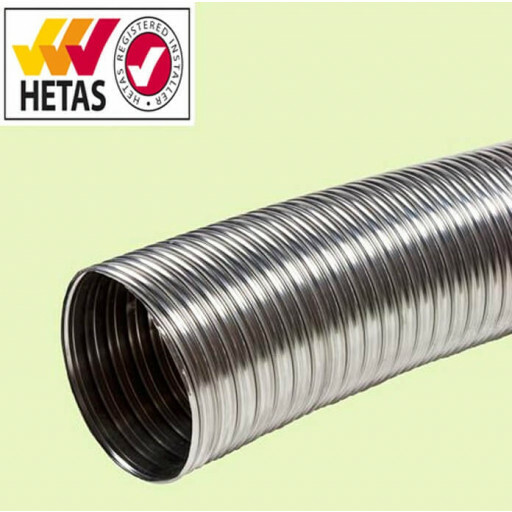 A solid fuel flexible liner, like this one, is used to reline masonry chimneys. The liner helps keep combustible gases from escaping through any cracks or holes in the masonry or mortar. The flexible structure of the liner makes it easy to install in almost any chimney. The beauty of this liner is the fact that, once installed, it is hidden from plain sight. It allows you to retain the look of your fireplace while ensuring your family's safety. It is the cost-effective alternative to rebuilding the masonry chimney stack from the ground up. You can get the liner in a number of lengths, just specify what you need.